Wimp! There were children on the beach in shorts and t shirts so what on earth was I doing in a scarf and hat?! Well this is a random outfit if ever there was one! It was our son's 13th birthday and one of his chosen activities for the day was to go crabbing off the pier. Although it's sheltered where the house is in Wales, many times I have been lulled into a false sense of security and when I've reached our destination, I've been freezing cold and blown to bits, so on this occasion I was prepared. I liked the light on this photo - it looks all LA but the outfit looks anything but! Granted I did feel slightly daft when there were children on the beach in only shorts and a t-shirt but I was glad of my Zara scarf (shoved into the bags at the last minute because it's warm and I like the colour) GAP hat (ditto but with even less thought as to colour) Jules wellies (just because I didn't want to risk trashing my suede "Harry Styles" boots, rather than because I was going to get wet) M&S sunglasses (found at the back of a drawer in the house in Wales presumably left here because I'm such a non-sunglasses kind of person that I never have them when I need them. Like today when I forgot to take them out with me.) And clearly as I put most of it on after getting out of the car and without the benefit of a mirror I look like a bag lady but there's nothing wrong with a bit of bag lady chic. When the sun shines here it's just beautiful! Three crabbing lines, three buckets, three nets - three happy children (and 24 crabs)! Jack Wills shirt, Dune boots, New Look jeans, Topshop T-shirt, Accessorise bracelets. As I think is pretty obvious, I don't do glamour in Wales. Not that it's not a glamourous place - far from it - have you seen Catherine Zeta-Jones, or Katherine Jenkins, or Catherine Middleton? (OK so she's not strictly Welsh, in fact she's quite possibly not Welsh at all but she's married to the Prince of Wales' son and she lived on Anglesey for a while). No, it's just that a) I am always under instructions to "pack light" which means that everything has to work together and b) we tend to be walking on the beaches, lighting fires, crabbing off the pier and chilling at home, so heels and dresses don't really fit into my lifestyle over here. 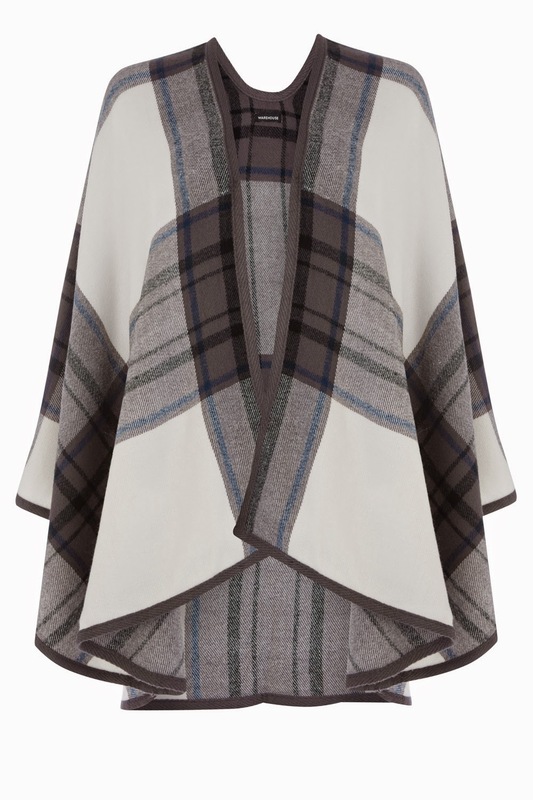 Warehouse checked cape £30 which I really like as it's a relatively inexpensive way of adding something to your wardrobe which is warm, practical and which will give a lift to an existing jeans/coated jeans and boots type outfit. 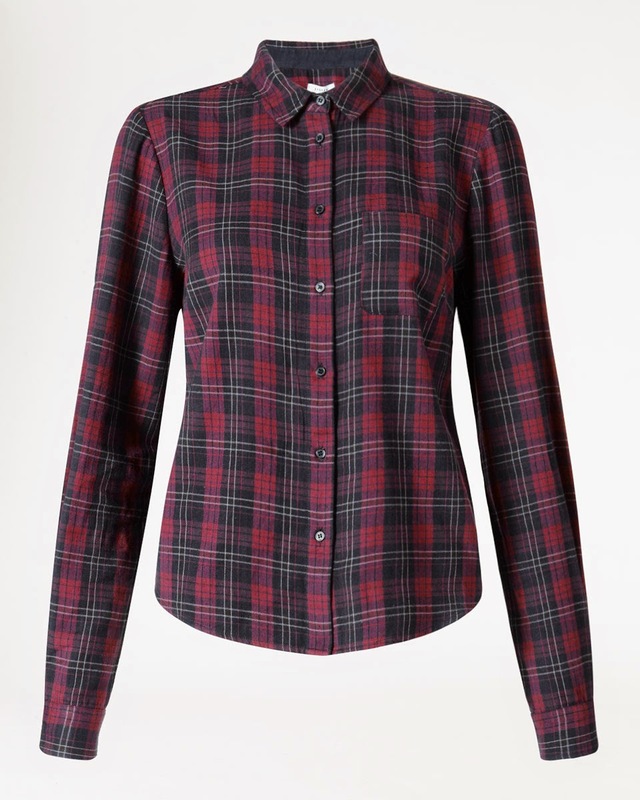 This Jigsaw cropped checked shirt (£59) is 100% cotton and comes in burgundy, which is having a huge revival this season, or blue. Easy to wear with black, blue or grey, it's a nice alternative to a denim shirt for a weekend look - especially for those who aren't fans of double denim. And the orange scarf sort of leads me on to this beautiful orange sky which greeted me a couple of mornings ago, having been woken earlier than I would like to have been by the youngest. All of which completely misses the point of this post which was to talk about how things that you may have added to your wardrobe over the summer, can be used to re-work pieces that you may have had last winter. In the above photo I've added in my favourite Topshop yellow T-shirt and a stack of bright bracelets from Accessorize, both of which pick out the colours in the shirt. It's not revolutionary but it's worth having a rifle through your wardrobe, taking out something that was OK last winter but perhaps not quite as it should have been and see what else you can add to it to make it work a little better - or in a different way. Just a thought for a rainy afternoon! I love this jumper which I've seen on several people. I think that there's something wonderful about wearing a jumper with 1970 written on it....unless like me you happen to have been born in that year - in which case it's not necessarily something that I would choose to advertise. This was the fourth attempt at what transpired to be terrible photos so please forgive me. I know, I should be sacked as a blogger! The first ones were taken inside and were so orange, as a result of the roaring fire that we didn't really need but which the pyromaniac 12 year old wanted to light, that I looked like I'd turned into Katie Price. The second lot were taken with the youngest indoors and me outdoors, so that she didn't get wet but they were so dark that everything that I was wearing looked black. The third lot had bags of rubbish in the background and the fourth lot (above) well I don't know what the six year old had been on but I wouldn't mind some. Hic! The purpose of the outfit - so far as there is one - is to fill you in on the H&M cashmere jumper (£49.99) which I bought a few weeks ago. 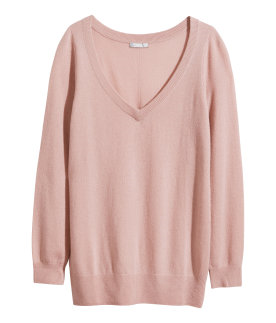 There's lots of high street cashmere around from H&M, to M&S, Boden, Jigsaw and Tesco. Last year I had a grey cashmere jumper from La Redoute and it was great, so it's not something that you need to spend a fortune on. Although having said that, all of my cashmere is high street so I don't really have a comparison to make and maybe others would disagree. I really like the colour of this jumper and its slouchy fit and our youngest likes me to wear it when I give her a cuddle before bed because she finds it so soft. So that's a fantastic excuse for wearing cashmere if ever there was one! But seriously, for anyone who finds wool too scratchy or stiff, cashmere could be the answer. In fact Mr SG is wearing a cashmere jumper today and he never wears jumpers because he hates how scratchy there are and for someone who could not give one jot about clothes, that is praise indeed. Most of my wardrobe is made up of staples with a few other bits and bobs added in each season. Cream is a neutral colour that I can wear without it draining the life out of me and I'm always on the look out for a versatile cream top. Throw in some lace too and it's got my name written all over it. Stripes, sequins, neon, navy, cashmere and denim have also been known to do it for me on occasion! I first saw this Ivory lace top Mint Velvet back at the end of the summer but at £79 it was more than I had in mind to pay. And then in John Lewis last week I came across it in the sale, reduced to £55. I had a good think about it and came to the conclusion that it was worth the investment. It's slightly longer than some tops I have which means that it offers a bit more bottom coverage (always useful) and although I like a white shirt, on occasion I feel much more comfortable in something like this - it's just a little less trussed up and formal. I would offer some alternatives but we're on holiday in Wales this week, without wi-fi, so I'm keeping it brief. Sorry! 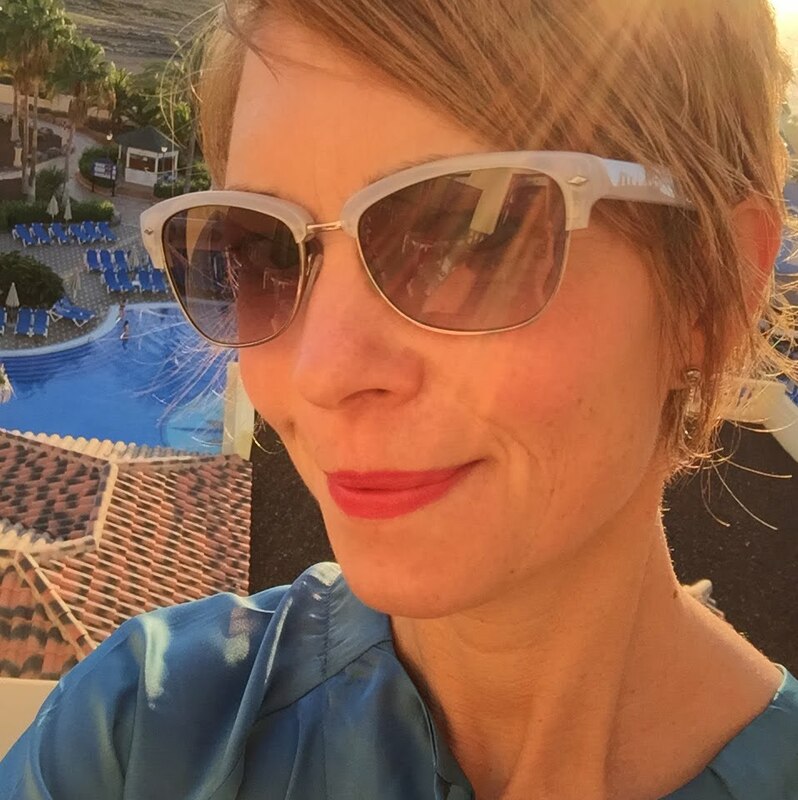 Keeping my promise to myself to keep wearing this Whistles wardrobe workhorse! Keeping my promise to myself to wear my Hana utility dress from Whistles as much as possible, here I'm wearing it for the second time this week. I wanted this dress to be a wardrobe work horse not only to justify its expense but also because it's the type of dress that I could wear for a multitude of different events - so I just need to make sure that do! For the daytime it's easy to throw on in the same way that I might wear a pair of jeans. Just so as to ring the changes slightly with this outfit, I layered a Jigsaw long sleeved top underneath it. It would work equally well for the evening though minus the striped top but with plenty of bracelets and leopard print, or sparkly, heels. And most importantly of all, it's warm! Today seemed to be the perfect temperature to wear this Zara fur (sleeveless) coat that I bought last year. I've been holding off from wearing anything that was too wintry but the temperature suddenly dropped this morning. Keeping in tone with the navy/black colour combo I wore it with a Cos roll neck jumper, navy Cos trousers and some furry (actually I think the technical term is pony skin) loafers from Whistles which I bought with the 25% Grazia discount a few weeks ago - although they don't seem to be online anymore. It was great until I actually got into the shops, at which point I was baking. Did anyone else hear India Knight on Woman's Hour this morning? I had a client coming down from Durham today so I was heading towards the shops slightly later than usual. India was talking about her new book which is all about with growing older. One of her tips was not to be too thin as it makes people look Simian like. Wondering to myself whether I looked slightly monkey like (short hair and no longer with the chubby cheeks I sported as a child/teenager, although fortunately without the ears that my Dad has) and what with my furry number too, I decided that it was a distinct possibility. And then as I went down the ramp into the car park a huge monkey appeared on the screen in front of me. And you know what, I decided that it was like looking in a mirror, which made me laugh - a lot. I'm surprised that I wasn't whisked away....to the zoo. I was shopping all day yesterday and after my race the day before, I decided that my toes needed a little bit of tlc. Oddly nothing really ached afterwards - keeping on the move definitely seemed to help - but nonetheless I wasn't convinced that six hours of heels would have been a good idea. Sometimes firm favourites are a good place to start for an outfit and whilst these don't quite fall into the category of clothes that I've had since our (nearly) sixteen year old was a baby, they've been around for a good few years now. So starting with the trousers, these wide leg ponte fabric trousers from Jigsaw are five years old now, the Oasis cream leather jacket must be about the same and the Topshop blouse too. My Marc Jacobs handbag was a 10th wedding anniversary present, so that's nearly 6 years old now. The newest addition are the Stan Smith trainers - comfortable to the end! So it's not always about new things - not at all - rather it's more about buying pieces in shapes that never really date. Not high fashion, just good quality staples. In my last post I wrote about just managing to hold things together on the home front and how I knew that, when I'd left the wet washing in the basket for so long that it went stinky and it had to be re-washed, it was time to have a few days off from blogging. Well a friend made me feel much better because she said that they couldn't actually do any washing in their household because they had run out of washing liquid. And things weren't looking too good on the loo roll front. Glad to hear that I'm not alone. Today I ran the Birmingham half marathon. I don't think that I was actually overtaken by the smurf but at times it was close and getting around the Sumo wrestler was tricky but do-able. I wanted to say a huge thank you once again to all of you who donated to Cancer Research UK and also to friends and people I know who cheered along the way. It all made a huge, huge difference at times when things were hard. After the race we headed to Pizza Express to re-fuel. Mr SG had dropped in to the pub after cheering me on so was unable to drive which meant we were left with the choice of walking there: "It will be good for you, you're meant to keep moving after a race aren't you?" (Mr SGs helpful contribution to the discussion), or with me driving. Oddly at that stage walking didn't hold any great appeal. The above shot is what I wore when we went out - flats and all manner of stretchy, comfortable things. A grainy shot of me at mile 12 doing some bizarre hand gesture of the waving variety - I think! Apologies for the leave of absence. When things start to get out of hand (and by that I mean when there's wet washing that hasn't made it on to the line for so long that it's gone stinky and needs washing again) then something has to give - and that something has to be the blog. Obviously I need to keep feeding the children, keep the house in a state which is semi-hygienic and then there's work to do too. Can you believe that in the last few days I've had 14 great outfits in the house all of which have been unpacked, hung up, used on the catwalk, packed up and returned to John Lewis without me even photographing one piece? Now that's bad. Really bad. So today I'm just doing a quick outfit post. In the pic above I'm wearing the Hush quilted sleeveless dress (£45). Let's guess why it appealed to me. Could it have had something to do with the word "quilted" in the description? My heat radar had it being in its sight as a dress which, despite being sleeveless, could still be warm enough to wear in the winter (indoors of course and with the heating on full blast). And I wasn't disappointed. It's soft and comfortable too. And the texture of it reminded me of a sofa that I had made when I bought my first house. Which is obviously as good a reason as any to like a dress. Isn't it? Plus I love winter white/cream. It's just, well, bright and happy really. I'm wearing it with a textured Reiss blazer and heeled loafers. When I get a chance I'll play around with necklaces etc but for now I thought that I would show it to you in its "naked" form. Jigsaw's latest campaign is all about celebrating fashion and they've asked people to help spread the word. As there's the potential for one of you out there to win £1000 to spend at Jigsaw, hopefully you will all think that this is a good idea! Jigsaw are trying to build a picture of what style looks like in the UK. It’s about women coming together to show off their sense of style, be it bold and alternative or classic and demure, rather than pushing trends. 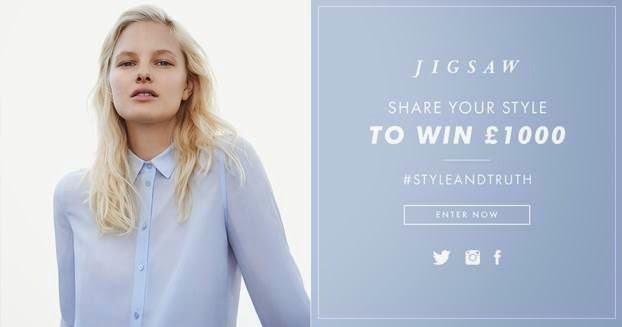 By sharing your look with the #StyleandTruth the image gets pulled into the Jigsaw style gallery and there's a chance to win £1000 to spend at Jigsaw. You can check out the gallery and submit a look at style & truth and you can learn more about the concept and the campaign here - which I personally like because it's just that little bit different. Good luck - I'd really love one of you to win it! Some lovely Jigsaw staples - and what does Jeremy Clarkson know about anything?! Firstly thank you so much to those of you who have donated to Cancer Research UK via my Just Giving page. I am so grateful to you and totally over emotional about the whole thing, to the point that I will probably drag my way around the half marathon course like a heaving, snotty, blubbering wreck - which let's face it isn't really going to help anyone. So thank you for your support. As to Thursday's event at Jigsaw (a store which was first introduced to me at law school in Chester in 1991 and I've been a fan ever since, so it was heaven for me to be working there) we had a fantastic time and thank you to those of you who came. I didn't manage to take any photos so instead I've pinched the top pic from twitter. I managed to take the quick snap of the lovely labels above which were written out by one of the girls who works in the store. Apparently she used to do them all the time for the cakes in her parent's café in Kent which was good because had I done them, they would have looked like the work of our six year old. We had lots of ladies there plus fizz, canapés and a raffle in support of Edward's Trust an incredible local charity which supports bereaved families; parents who have lost children and children who have lost parents. They offer counselling, holistic therapies and retreats. I went to a garden party last summer and observed the artwork of bereaved children both before, and after, counselling. Let's just say that too resulted in tears. What is it about having children that turns you into an emotional wreck?!! For the event I wore all Jigsaw clothes - partly my own and partly borrowed. 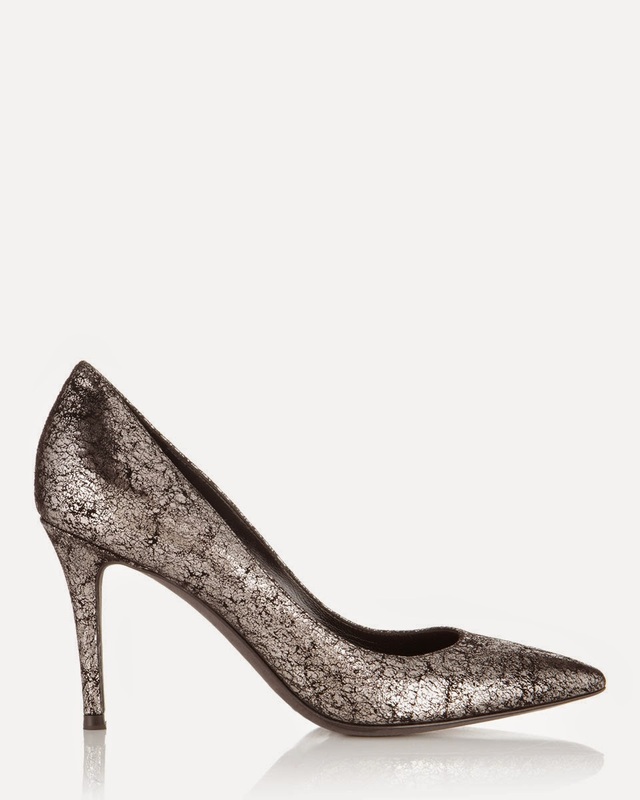 To start off with I chose these metallic shoes - Jigsaw (£149). I have to say that they are possibly the most comfortable high heeled shoes that I have ever worn. When I read about them, I saw that the outside was made of kid suede and the inside was kid leather - which probably explains their softness. For anyone who struggles with finding high shoes that are comfortable I would definitely recommend trying these. Speaking from experience, one pair of comfortable heels, especially metallic ones which will go with everything, are far better than 5 cheaper pairs of shoes which are crippling. 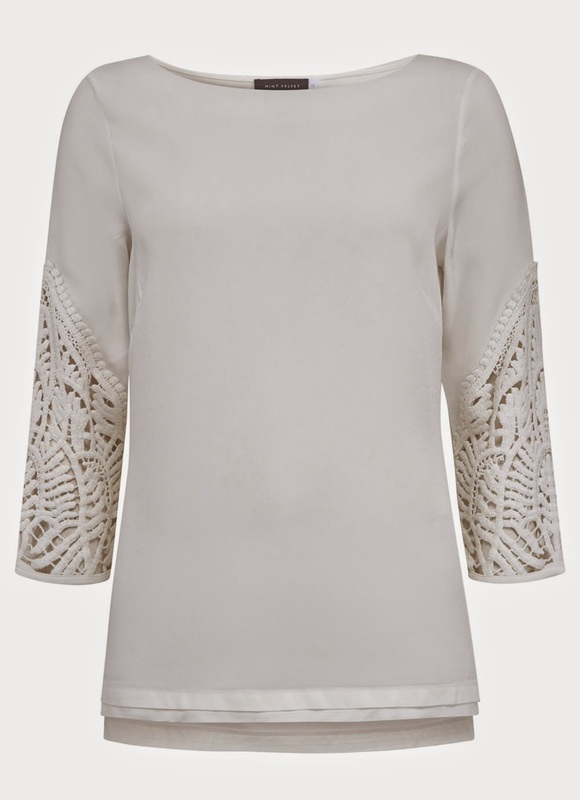 I also wore this silk front batwing top Jigsaw (£79) which was lovely. As it has a band around the waistband, there's a little bit of "overhang" of fabric just above it which is sufficient to accommodate any other type of "overhang" that might be going on in the tummy department. Perfect for a meal out. And the batwing isn't really batwing at all, just in case anyone steers clear of them either to avoid connotations of a 1980s type, or because they have a larger bust. 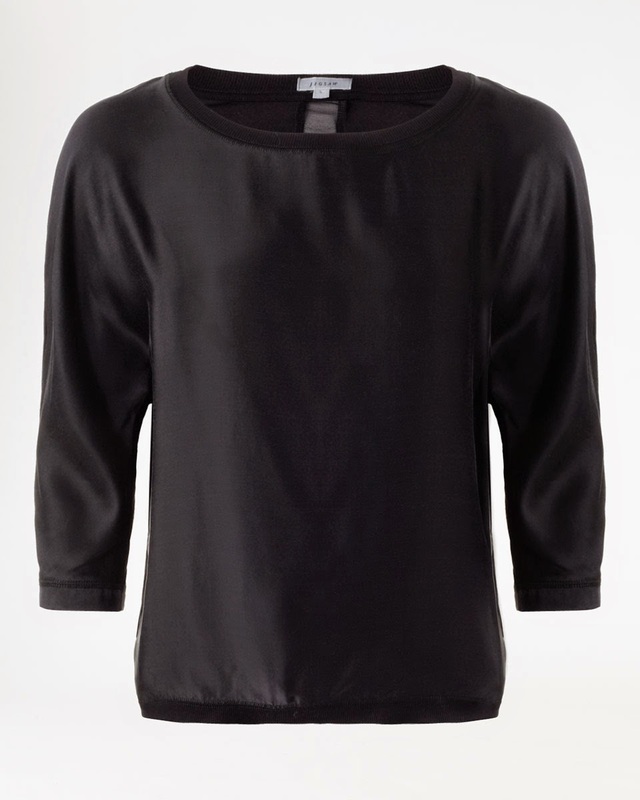 I would go so far as to say that this is my perfect black top. 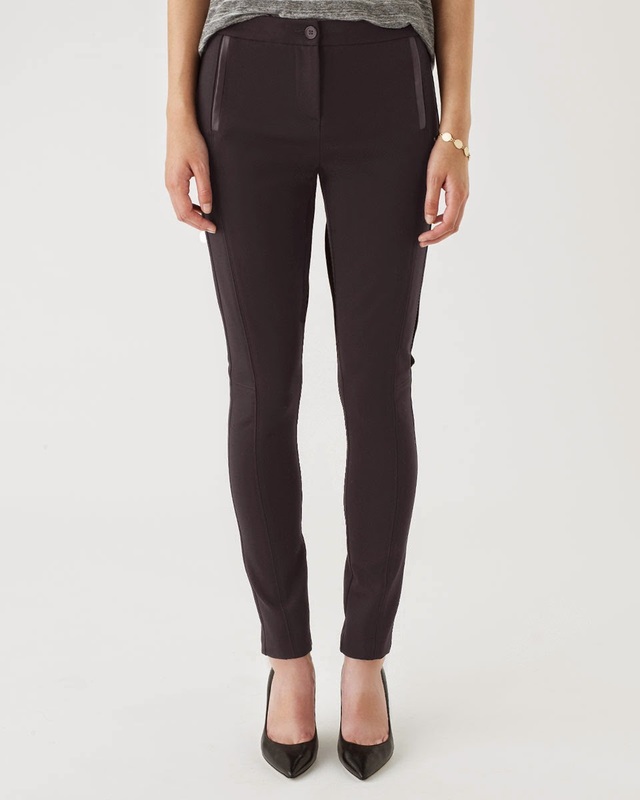 I also wore the Jigsaw woven riding leggings (£79) which are great. Thick, supportive, with a decent rise and tight but in a good way, rather than a scary way. 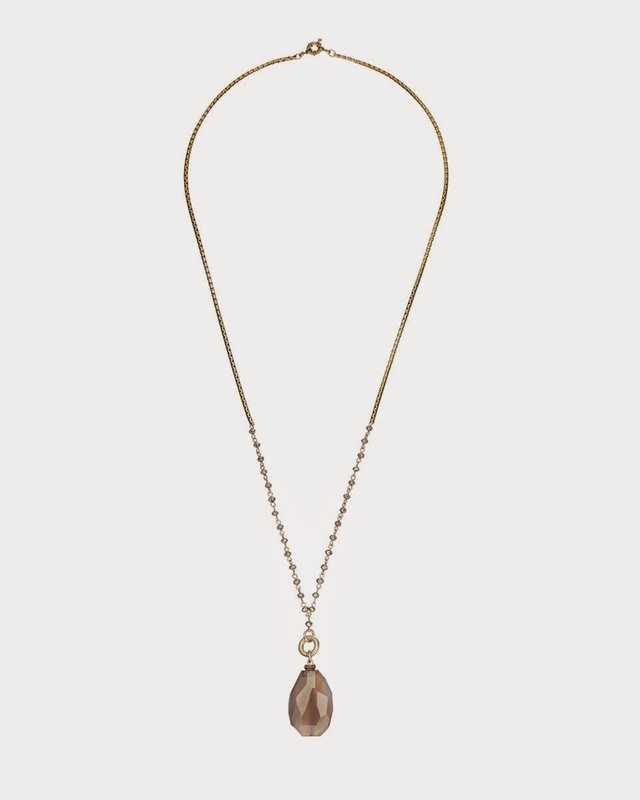 And finally I wore the large stone drop pendant Jigsaw (£49), albeit with a slightly different coloured stone and which sparkled when it caught the light. For anyone on the look out for some good staples, I can definitely recommend the shoes, top and trousers. For anyone on the look out for anything else, there are some fantastic pieces from the clutch bags to the jewellery, from the cashmere hoodies to the lace party dress, the pleated skirt, the black fur swing jacket (yes lovely friend, your husband had great taste in buying that for you for Christmas - didn't he do well?!!!) to the check coat and the cropped striped sweatshirt. Jigsaw is a very tempting place right now. On Tuesday evening Mr SG and I went to see Kylie in Birmingham except, to start off with, we went to the wrong venue in Birmingham - a venue which isn't strictly in Birmingham at all - but rather one which is near the airport. As we were driving out of the City we noticed the traffic and commented to one another on how there must be something happening in the City that night to cause the hold up. We even discussed how it had taken Mr SG 40 minutes to get home that evening because "something was going on" and still the penny didn't drop. In fact the penny didn't drop until we reached the "other" venue and there wasn't any traffic at all. Then I actually read the tickets and we did a very quick about turn. What I've realised about those nights out is that they often act as a time for reflection. Yes, you're listening to the music but as well as that there's time to process the things that you don't get time to think about otherwise. During the concert I looked at Kylie. As well as noticing the miracle of her walking and dancing in ridiculously high shoes and in getting up from a kneeling position without a wince in sight, I noticed her long curly hair and how it had grown back after her chemotherapy. I remember exactly where I was when I heard that she had been diagnosed with cancer - standing in a lift going to the 22nd floor of the building where I worked at the time. And I remember exactly where I was sitting just a few months ago, when my Mum told me that a girl from school had been diagnosed with cancer. A diagnosis of cancer is never a right thing but this just felt so wrong. On every single level it felt wrong. There's not much that I can do to help - I'm not a doctor or a miracle worker and I don't live near - but I can run (of a fashion!) and in just over a week I am running the Birmingham half marathon. Via a friend I asked the girl from school which charity she would like me to fund raise for and she said Cancer Research UK. And that was what I reflecting on when watching Kylie. Should I mention it on here and ask people for sponsorship? And then I concluded that I would. The blog is generally my voice and sometimes it's good to give someone else a voice. This morning, my running vest arrived and I took it as a sign that it was time to take action, so here is the link to my Just Giving page for anyone who would like to sponsor me. It's taken me until now to work out how Just Giving works and you know it's really handy because it's just like buying a piece of clothing online - something most of us are pretty good at! We all have huge demands on our resources whether it be time, money, energy, or all three, and many will have commitments to other charities. But for anyone who feels like sparing a few pennies or pounds, I would really, really appreciate it. And so too, I am sure, would the girl from school. For those of you with your eye on the ball, or your ear to the ground - or just if you've been out shopping really - you can't but fail to notice that checks are everywhere. Checks can have connotations all of their very own, depending on their size and colour way. From picnic blankets to Rupert bear, we've heard it all before and do we care? Hmmm, maybe, particularly if they're plastered across one's thighs, other than that? Nah! Typically I'm starting with a coat that isn't even checked. It was written about in the press over the summer and I saw this wool blend coat in & Other Stories (£145) a few weeks ago now. 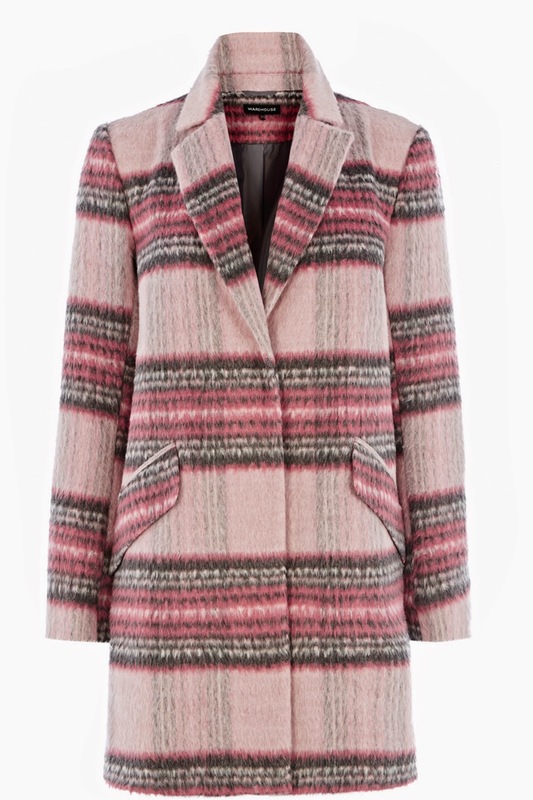 Predictably the pink jumped out at me and I think that it was this coat that started me down the road of checks. This one wasn't right a) because it's not checked and b) the lack of joining up in the stripes department would drive me nuts - but I still like it. Then I came across this checked coat in Warehouse (£95). Having spent a lot of time in the stores recently, it keeps jumping out at me. 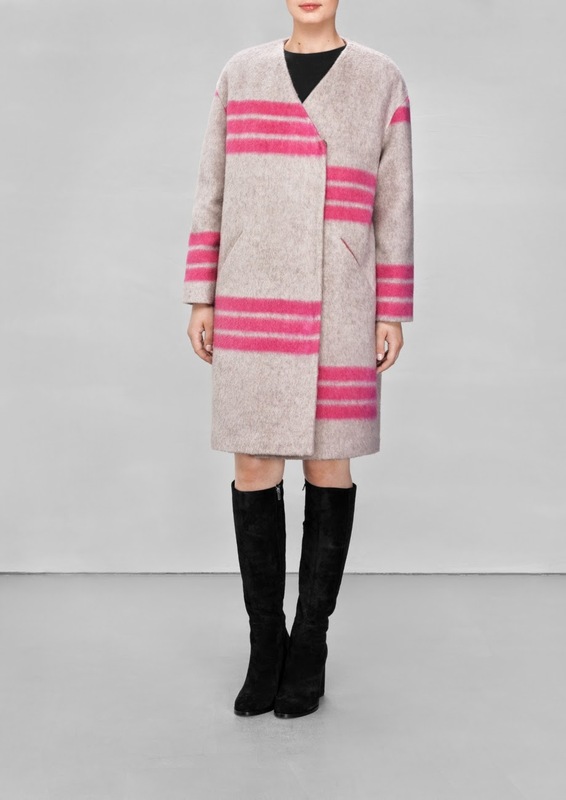 Pink and grey are a lovely combination and this coat would add a nice touch against darker winter clothes. 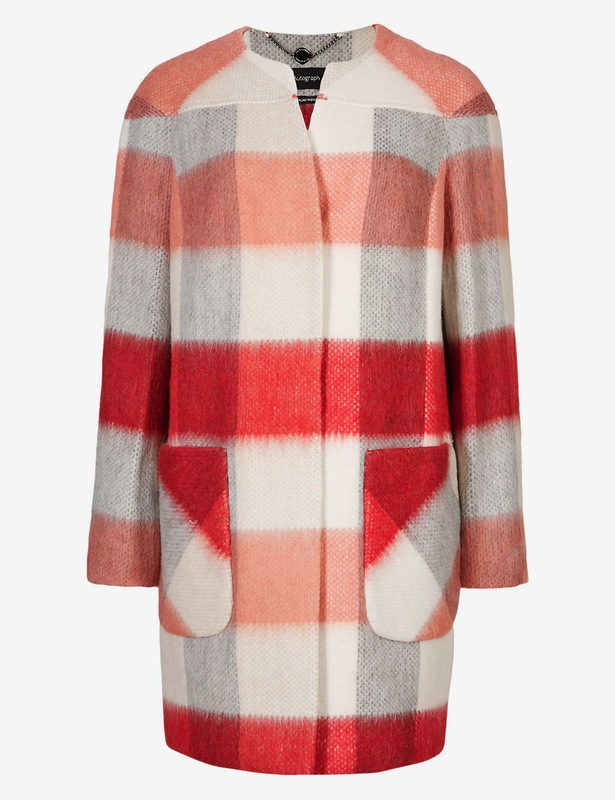 And then yesterday whilst working in M&S I came across this checked coat (£139). I spotted it from a distance across the store and went for a closer look. As they only had it in a size 20 or 22 I didn't think that I would get a true representation of what it would be like on me so instead I ordered it to our local store and I've just had the email through to say that it's been received. So guess where I'm off in a mo?! The checked capes that are around can be harder to wear. The proportions need to be right and there is the danger that they will swamp but there is something that I find very appealing about them. For a start you could wear a million thick jumpers under them and there would be no issue about not being able to get your arms down the sleeves of your coat. There's also something a bit "swishy" and dress like about them, even if they're being worn with jeans and boots. I keep gravitating towards this one from Warehouse (£30). For anyone unsure about a whole garment made of checks, there are some great scarves around this season. 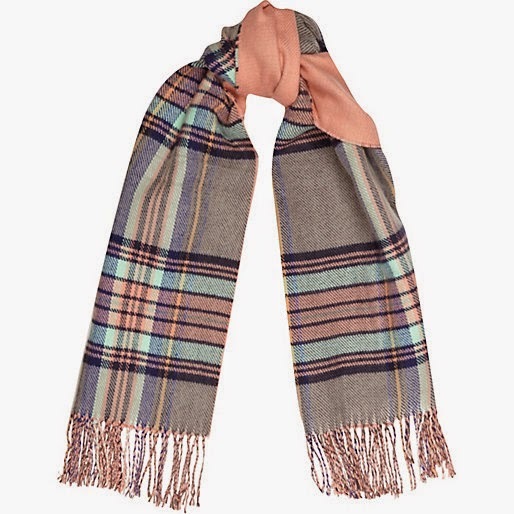 I love the colours in this River Island coral blanket scarf (£22), which also comes in different colour ways. And Mango has more check scarves than you could even begin to imagine. Use one as a way of giving a new lease of life (otherwise known as tarting up) an older coat which needs a bit of va-va-voom. 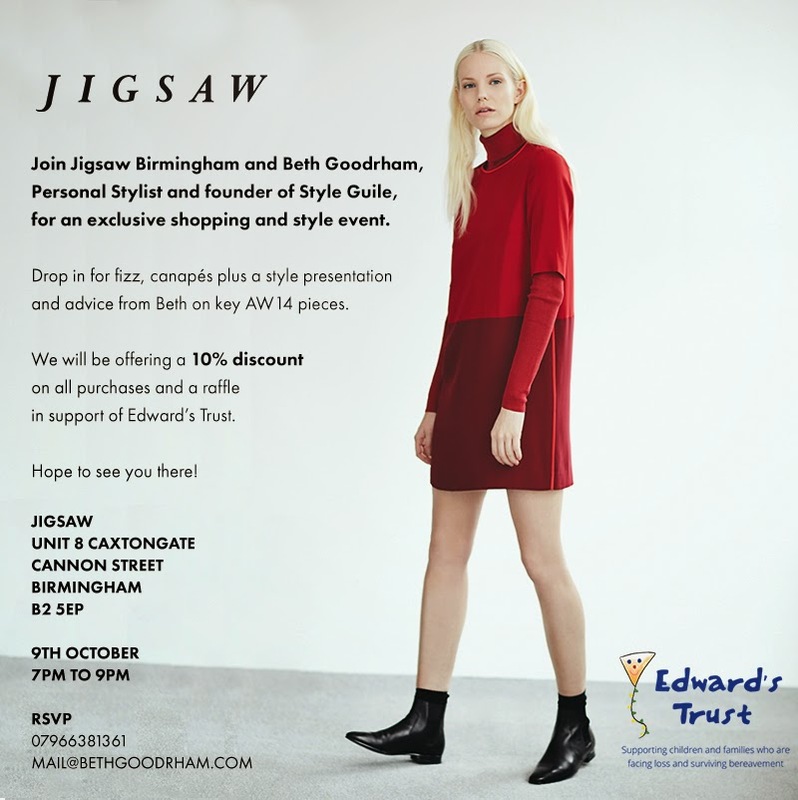 Tomorrow I am spending the day in John Lewis who are kindly lending me some outfits for an event I am styling next week (invitation to follow shortly) but for now, here's the official Jigsaw invitation for the event we are running at the Birmingham store this Thursday. Please drop me an email at style@bethgoodrham.com if you would like your name adding to the guest list. We'll have a 10% discount on the night and a chance to win a Jigsaw gift card for £100. I'll be covering lots of different looks and with fizz and canapés on offer, I think we'll have a ball. For those of you who have already responded, I look forward to seeing you there. Topshop printed trousers with (yet more) sparkles. Ooooh golly, it's such a busy time of the year work wise that I don't have time for my usual ramblings - which is probably a relief to many. I bought these Topshop printed trousers before the summer holidays but I hadn't got around to wearing them. However since buying my black pointy Dune shoes (these are great Halloween shoes!) it's made wearing quite a few outfits just that little bit easier. With a block heel and strong style, they go with lots of things and together with a navy sequin jumper from many moons ago, I really liked wearing these trousers. There are lots of printed trousers around this season - lovely ones at Zara and H&M too. At £14.99 the H&M ones are a really good buy. They are 98% cotton and 2% elastane so they have a nice feel plus a little bit of stretch. Amusingly - or so I thought - they are called "slacks" on the label, which is what my Grandma always called trousers. I know that I've said it before but for anyone less sure of printed trousers, a dark background with a lighter print is more flattering. And there's these great H&M cashmere jumpers (£49.99) which work really well over a printed trouser as they offer a little "bottom coverage" without being too loose and baggy. I've linked to the page so that you can see the different colours. The one that I have just bought is a pretty peachy/light coral colour which will pick up the same colour in the trousers. H&M also have a lovely grey cashmere cardi and a round neck jumper style too - so it's worth taking a look if you fancy a little bit of cashmere but at a more reasonable price. I'm away for a couple of nights in Wales with some friends over the weekend so I'll blog when I get back. So far I've packed a Onesie and my trainers - an interesting sartorial combination if ever there was one.